A New Low For Nigeria As Oil Thieves Drag National Economy, Global Markets Down. Hidden by mangrove trees in the murky swamps of Nigeria's southern Delta region, a thief stealthily bores a hole into a giant oil pipeline. The crude he siphons off might be on its way to a domestic makeshift refinery, or shipped to buyers abroad. Either way, the illicit income earned will help this criminal to keep his head above water in a nation wracked by poverty. It's hard to believe this type of crime could have a significant impact on global oil markets. But in Nigeria, the scale of oil theft is massive. The people who participate in this underground market are called bunkerers, and the central government is doing its best to combat what has lately become the greatest threat to its export economy. Recently, Nigeria reached a low point. Production this summer is at 1.9 million barrels per day, or bpd, which is down from an average of more than 2.5 million bpd last year. This is the lowest output Nigeria has seen since 2009. The country boasts the second-largest economy on the African continent, and is still the biggest oil producer in Africa -- but just barely. Angola, which is striving toward a goal of 2 million bpd, is on track to surpass Nigeria's production as early as next year if current trends continue. As crude spills in the south, officials in Nigeria's capital city of Abuja are becoming desperate. The government's approach is two-pronged: It is already paying some would-be thieves in order to de-incentivize bunkering, but that stop-gap measure isn't holding up. The military, meanwhile, is taking a much more aggressive tack. “Illegal refineries are not far away from the communities. We will not allow them to continue to operate. When we locate them, we destroy them," said Maj. Gen. Bata Dabiro, commander of the Joint Task Force in Niger Delta, according to Nigerian newspaper The Punch. "We also destroy their tanker trucks and... boats. Thousands of illegal refineries have been destroyed and 24 vessels arrested." Despite all this, Nigeria loses at least $7 billion annually to oil theft and illicit refining, according to the latest Oil Market Report from the International Energy Agency, and it's only getting worse each year. Officials reported a whopping 17 percent drop in official oil sales as a result of theft in the first quarter of 2013, which amounts to a loss of $1.2 billion over the course of a single month. Oil thieves do more than just siphon crude for themselves. Their activities can also introduce pollutants into the crude, damage infrastructure or cause fires and explosions. That scares off investors and major companies including Royal Dutch Shell PLC (NYSE:RDS.A) and Chevron Corporation (NYSE:CVX) have faced setbacks as a result of thievery-related damages in Nigeria and are increasingly favoring offshore projects. The ripple effect is huge. 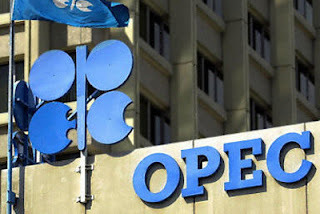 Nigerian production losses are having a significant impact on total output for Organization of Petroleum Exporting Countries, or OPEC, of which Nigeria is a member. Last month, the bloc's output was 30.31 million bpd, down 1.1 million bpd year-on-year, due largely to stability problems in member countries including Libya, Iraq and Nigeria. That only adds to OPEC's ongoing problems of faltering demand and stiffer competition from North America. The U.S. in particular has been ramping up exports to China, one of the biggest consumers of OPEC petroleum. To top it all off, oil companies are at odds with the Nigerian government over a proposed plan to increase taxes for foreign investors. Abuja sees the Petroleum Industry Bill -- which could entitle the government to around 75 percent of oil profits -- as a way to replace funds that have been lost to bunkering. The revenues would ostensibly be spent on development but oil company representatives have argued that the bill would only deter investment and thereby cut profits for everyone involved. As oil corporations wrestle with officials in Abuja over how to distribute the spoils of dwindling petroleum supplies, Nigerian citizens are focused on a deeper issue: development. Oil, which makes up 95 percent of Nigeria's export revenues and gives the country a per capita GDP of $1,555, has so far failed to lower poverty, which affects more than half of the population. Corruption in government has confounded development efforts for years, creating an enormous wealth gap that has angered citizens. In that context, thievery becomes all the more enticing to Nigerians with nowhere else to turn. Nigeria is already on the brink of losing its title as Africa's biggest oil producer, especially as investors begin to back away. And, if Abuja cannot address its oil theft problem soon, petroleum production levels -- and with it, Nigeria's entire economy -- have little hope of a rebound. Tanker drivers and Owners operating at the Tema Oil Refinery, who withdrew their services nationwide yesterday, have resumed work. The resumption follows a meeting with the Minister of Energy, Emmanuel Amah Kofi Buah, at which a road map to phase off the old trucks gradually was drawn. The agitated Tanker Drivers and Owners registered their displeasure with the National Petroleum Authority, NPA's, ban on the use of tankers that are over 12 years in transporting petroleum products. Speaking in an interview with Radio Ghana, the Chairman of the Tanker Drivers’ Union, Eric Teye Amoako, explained what transpired. Crude oil throughput volumes at Sunoco Logistics' Nederland Terminal on the Texas Gulf Coast increased by 35% from 690 million b/d in Q2 2012 to 932 million b/d in Q2 2013 –nearly a million barrels a day. By the end of 2014 another 1 million b/d of crude will be flowing through Nederland, as it becomes a pivotal storage and distribution terminal for Gulf Coast refineries. Nederland is at the heart of the company's successful crude oil storage and pipeline distribution network. The terminal is located on the Sabine-Neches waterway between Beaumont and Port Arthur, Texas. The location is in the heart of Beaumont/Port Arthur refining country – home to four large refineries owned by ExxonMobil (Beaumont, 365 million b/d), Valero (Port Arthur, 310 million b/d), Total (Port Arthur, 174 million b/d) and Shell/Saudi Aramco (Motiva 600 million b/d). A decision on the fate of the proposed Keystone XL pipeline will likely be delayed until after the release of an inspector general investigation into conflict of interest complaints, a process that will take at least until early 2014, The Hill reported Friday. The Office of Inspector General is looking into complaints that Environmental Resources Management (ERM), the contractor that prepared the most recent environmental impact statement on Keystone XL, failed to disclose potential conflicts of interest. ERM had previously done work for TransCanada, the company seeking to build the pipeline, and other oil companies that could stand to benefit from it. The connections prompted environmental groups to call for an IG investigation. A State Department official did not directly respond to The Huffington Post's request for comment about whether and for how long the IG report may delay a final decision on Keystone XL. The official, who would only comment on background, said that the IG's review "will provide independent and impartial assessment" of the Keystone XL review process. The department is cooperating fully, the official said, and is "committed to a rigorous, transparent, and efficient federal review of the Keystone XL application." But given the attention that the Keystone pipeline has attracted, it is unlikely that the State Department will make a decision on the pipeline before the IG report is finalized. Because the proposed pipeline would cross an international border, the State Department is the agency with the authority to approve or reject Keystone XL. Before this latest news, the State Department had been expected to issue a final environmental impact analysis on the pipeline sometime this fall. The environmental assessment will inform the State Department's decision on whether to approve permits for the construction of the pipeline. Environmental groups cheered the delay, but said they want the Obama administration to reject the pipeline right away. "President Obama doesn't need to wait for the results of the investigation into Environmental Resources Management," said Ross Hammond, a senior campaigner at Friends of the Earth. "He has all the evidence he needs to deny the permit right now." The IG's office previously evaluated the department's handling of Keystone XL in 2011, after environmental groups and some members of Congress raised conflict-of-interest concerns about another contractor working on the project. That evaluation did not find any significant problems with the State Department's process. Workers of Tema Oil Refinery (TOR) have expressed worry about delays by management of the refinery to address their concerns despite a promise to do so last week. The workers embarked on a demonstration two weeks ago to demand the dissolution of Board of Directors of the country's only crude oil refinery who, according to them, have not lived up to expectation since their appointment in 2009. The workers say the seven-member board has failed to reverse the declining fortunes of the refinery. TOR workers also claim the board has also failed in negotiating their 2013 salaries. Junior Staff Union Chairman, Emmanuel Oduah Offoh, told Joy News although the refinery has been supplied with crude oil, it is locked. He explained that inability of workers to access the crude oil, even though the product has been pumped to the refinery suggests, TOR has not paid for it - one of the many causes of TOR's dwindling fortunes. Although Managing Director of TOR, Ato Ampiah, promised on the Super Morning Show to meet with workers to discuss the issues when TOR workers began agitation, Emmanuel Oduah Offoh said that is yet to happen. The Organization of Petroleum Exporting Countries will reduce shipments through to early September as summer demand for driving fuels ebbs, tanker-tracker Oil Movements said. The group, which supplies about 40 percent of the world’s oil, will cut exports by 320,000 barrels a day, or 1.3 percent, to about 23.6 million barrels a day in the four weeks to Sept. 7 from the period to Aug. 10, the researcher said today in an e-mailed report. The figures exclude two of OPEC’s 12 members, Angola and Ecuador. “It’s getting toward the end of the season for east and west,” Roy Mason, the company’s founder, said by phone from Halifax, England. The cuts are “mainly eastbound,” he said. Refiners typically trim imports at the start of the third quarter while performing maintenance as summer demand for gasoline and diesel fades. Brent crude traded today at about $109.90 a barrel on the ICE Futures Europe exchange in London, having climbed to a four-month high of $111.53 on Aug. 15 as labor strikes constrain exports from Libya. Middle Eastern shipments will drop by 1.8 percent to about 17.3 million barrels a day to Sept. 7, compared with about 17.6 million in the month to Aug. 10, according to Oil Movements. That figure includes non-OPEC nations Oman and Yemen. Crude on board tankers will decline 5.7 percent to 472.2 million barrels on Sept. 7, data from Oil Movements show. The researcher calculates volumes by tallying tanker bookings, and excludes crude held on vessels for storage. OPEC’s members are Algeria, Angola, Ecuador, Iran, Iraq, Kuwait, Libya, Nigeria, Qatar, Saudi Arabia, the United Arab Emirates and Venezuela. It will next meet in Vienna on Dec. 4. The on and off again protests and strikes at Libya’s oil ports have led to the country being unable to schedule crude deliveries. NOC, the state-run firm, said in a statement that it could not provide loading schedules for September delivery. Estimates put exports as low as 300,000 bpd, taking an estimated 1 million bpd of Libyan crude off the world market. “Due to continuation of strikes in some Libyan terminals (Ras Lanuf, Es Sider, Zueitina, Marsa al-Hariga) … we are not able to allocate any quantity of crude oil exports from those terminals during September 2013,” the NOC statement said. Deputy oil minister Omar Shakmak estimates current oil production at 700,000 bpd, but many analysts have knocked a few hundred thousand off that estimate. “There is still no resumption at Ras Lanuf, but if Es Sider restarts maybe Ras Lanuf will follow,” he said. The price of oil fell again Tuesday, slipping toward $106 a barrel, as traders waited for the U.S. central bank to signal when it will start scaling back its monetary stimulus. By early afternoon in Europe, benchmark oil for October delivery was down 78 cents to $106.32 a barrel in electronic trading on the New York Mercantile Exchange. The September contract fell 36 cents to settle at $107.10 on Monday. Evidence that the U.S. economy is improving has led to speculation that the Fed will begin to reduce its $85 billion a month in asset purchases as early as September. The bond-buying program was initiated to help the U.S. economy recover from a tough recession following the 2008 financial crisis. The Fed's stimulus policy has lowered interest rates and made oil and other commodities a more attractive investment by offering potentially higher returns. A "tapering" or phasing down of the program, expected as early as next month, could push oil prices down. Global stock markets have been retreating in recent days as investors scurry to the sidelines to wait out the uncertainty. Traders were awaiting the release Wednesday of minutes from the Fed's July policy meeting for hints of whether and when the bank might begin cutting back on its bond-buying. "As a result of the bearish mood, crude prices have slipped ... sparked by nervous investors taking profit," said a report from Sucden Financial Research in London. "Prices are still well supported at key levels owing to the unrest in Egypt and Libya." Egypt, which controls the Suez Canal crucial to shipping in the Middle East, has been rocked by clashes between police and Islamist protesters after the ouster of President Mohammed Morsi. Libya's oil exports, meanwhile, have fallen sharply due to production outages and strikes at export terminals. Later in the day, investors will also be monitoring fresh information on U.S. stockpiles of crude and refined products. Data for the week ending Aug. 16 is expected to show draws of 1 million barrels in crude oil stocks and 1.5 million barrels in gasoline stocks, according to a survey of analysts by Platts, the energy information arm of McGraw-Hill Cos. The American Petroleum Institute will release its report on oil stocks later Tuesday, while the report from the Energy Department's Energy Information Administration — the market benchmark — will be out on Wednesday. Crude stockpiles have declined in seven of the past eight weeks. Brent crude, which is used to price imported oil used by many U.S. refineries, was down 44 cents to $109.46 a barrel for October delivery on the ICE Futures exchange in London. — Heating oil fell 0.41 cent to $3.0752 per gallon. — Wholesale gasoline lost 1.3 cents to $2.8033 a gallon. — Natural gas retreated 1.5 cents to $3.448 per 1,000 cubic feet. About US$15 to US$420 billion is expected to be invested in Ghana's oil and gas operations for the next five years, the Chief Executive Officer (CEO) of the Ghana National Petroleum Corporation (GNPC) Nana Boakye Asafu-Adjaye, has disclosed. Nana Asafu-Adjaye, who made the disclosure at the inauguration of the GNPC Oil & Gas Learning Foundation in Accra, yesterday, described the establishment of the Foundation as another important milestone in meeting the GNPC's mandate to ensure that Ghana derived the greatest possible benefits from the development of its petroleum resources. He said the GNPC had two other mandates, namely to obtain the effective transfer to Ghana of the appropriate technology relating to petroleum operations and to ensure the training of citizens of Ghana and the development of national capabilities in all aspects of petroleum operations. The GNPC Chief Executive said the GNPC Oil and Gas Learning Foundation was, therefore, an effort to give more meaning to the third mandate of the GNPC and that the GNPC was approaching the twin core mandates in a planned and strategic way under its 2012-2020 Accelerated Growth Strategy. He said the Strategy was made up of four pillars, namely building the capacity and expanding activities to enable the GNPC to do more for Ghana; Replacing and growing reserves to ensure that the Oil & Gas sector could contribute to deliver value to Ghana; Efficient capitalisation and optimum participation to position GNPC property in the industry; and Catalysing local content development. In an address, the Minister for Energy and Petroleum, Emmanuel Armah Kofi Buah, pledged government's commitment and support to the development of the Oil & Gas industry. Mr Buah expressed confidence in the ability of members of the Governing Council of the Foundation to deliver on their mandate. The Chairman of the Foundation Council, Mr Kwame Peprah, gave the assurance that the Foundation would work hard to ensure the training of citizens to help the development of national capabilities in all aspects of petroleum operations so as to fulfil the GNPC's mandate and the country's local content aspirations. "We remain committed to giving opportunities to Ghanaian nationals through a strong recruitment and training programme aimed at boosting local capacity in the industry. The Foundation will partner with government to create strategic learning opportunities that would enable Ghanaians increase their involvement in and control of our national resources for their benefit," he stated. The GNPC Oil & Gas Learning Foundation is a company limited by guarantee, initially with the GNPC as its sole subscriber who, in 2012, made an initial allocation of US$3million to the Foundation. The Foundation is an independent institution set up by the GNPC under section 2 (2) of PNDC Law 64 to implement one of its statutory objects in the area of higher education in Oil & Gas-related studies. 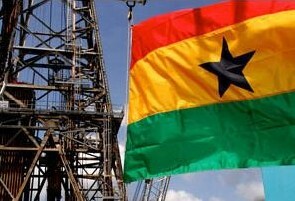 The Foundation, which was inaugurated on the theme: Deepening Expertise and Local Participation in the Oil and Gas Sector, is, therefore, expected to support institutions by collaborating to build national capacity in Oil & Gas sciences, policy, management and operation in order to achieve local content aspirations and deepen local participation in Ghana's Oil & Gas industry. In other words, the Foundation aims to give focus to a large scale rapid development of the skills and techniques required to meet the individual and institutional capacity needs of Ghana's Oil & Gas industry. The objects of the Foundation are to receive funds from GNPC and other sources; invest the funds received so as to generate a sustainable income; make donations to institutions, projects and individuals that support the development of national capacity in the Oil & Gas industry; support the establishment and development of a GNPC Petroleum Training Institute; and do such other things necessary in the pursuit of the above. The Foundation has Prof Naana Jane Opoku-Agyemang, Minister for Education; Mrs. Alexandra Amoako-Mensah, Consultant in the management of Industrial Minerals; Mr Samuel Garba Boman I, current Administrator of the Ghana Education Trust Fund; and Nana Boakye Asafu-Adjaye, CEO of the GNPC as Council members. Tema — Junior staff members of the Tema Oil Refinery (TOR) have called on the government to, as a matter of urgency, dissolve the seven-member Board of Directors of the company for inefficiency. According to the workers, the board members lack the expertise and competence to handle a corporate entity like the nation's only oil refinery. They noted that the board members seemed to be interested in drawing fuel from the refinery and other filling stations outside the refinery, as well as take fat sitting allowances and bonuses without doing what is expected of them. The workers alleged that between January and July this year, a whopping GH¢200,020.53 (¢2 billion old Ghana cedis) has been spent on the board members in sitting allowances, bonuses, fuel from TOR, and monthly fuel coupons for filling stations outside TOR. "This amount excludes their lunch and lodging before, during, and after their meetings," the workers claimed. The breakdown of the figure is as follows: "Bonuses for the board members as at December, 2012 - GH¢43,333.33; sitting allowances from January to July, 2013 - GH¢103,349.00; fuel consumed by the board members at TOR filling station alone, from January to July 2013 - GH¢11,838.20, and monthly fuel coupons for the board members for filling stations outside TOR - GH¢41,500.00." This came to light when the workers embarked upon a short but powerful agitation at the premises of the refinery on Tuesday, when members of the management and executive members of the senior staff union of TOR, and Union of Industries, Commerce and Finance (UNICOF) held a meeting to discuss the mandate of the workers to negotiate for salary increase. The workers first converged within the walls of the company quietly observing what was going on at 13:00 hours. But when the meeting prolonged, the workers became agitated and started showing glimpses of impatience, shouting in the process. Addressing the media after the meeting later in the night, Emmanuel Eduah Offoh, Chairman of the Junior Staff Union, which is the General Transport, Petroleum and Chemical Workers Union of TOR, said the reason for the agitation was the workers' mandate to bargain their salary increase for 2013. He said, since January this year to date, they had been chasing management to come to the negotiation table to discuss their mandate for a salary increment, but were told that the board did not have the mandate to allow them do the negotiation. Meanwhile, the board has approved a salary increment of 120% for the Managing Director of the refinery, Mr. Ato Ampiah, and backdated it to June, 2010, even though it claimed that it did not have the mandate to do so for the workers. According to Mr. Eduah Offoh, the TOR Managing Director had since collected his back pay from June 2010 to date. The Chairman of the Junior Staff Union disclosed that if, as a board, they had not been able to approve of the 2013 corporate budget for the company, as at August, then how were they running the refinery? He explained that the workers were of the opinion that the Board had stabbed them in the back, because, in order for them to have a smooth negotiation process, the workers sacrificed all they had, including their lives, to ensure that they put the company in good shape before they talked about negotiation, but it looked as if the Board was not enthused with their gesture. "As partners of the refinery, we decided to help put the refinery in shape, which, indeed, we have succeeded, so that when we get to the negotiation table, at least, they could see eye to eye with us. We did all these things, to the extent that we work in the plant without protective gears. "We sacrificed our lives for this company, and now that we are here, this is what management is telling us - that they don't have anything for us. We will not agree to that. This is why we are calling on government to dissolve the board," he noted. In the meantime, the management of the refinery is tightlipped over the issue, and has refused to comment on it. 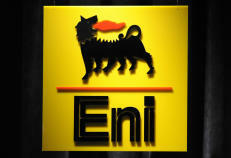 Italian firm ENI has agreed to pony up the $400 million in sales tax to the Mozambican government on the sale of a portion of its stake in Offshore Area 4 to Chinese firm CNPC. ENI’s sale of nearly 30% of its Mozambican subsidiary to CNPC gives CNPC a 20% stake in its lucrative Area 4 offshore gas field. The Italian firm is still the operator of Area 4 with a 50% stake. ENI said it had also agreed to build a 75-MW power plant in Mozambique’s northern Cabo Delgado province, near where its massive natural gas discoveries were made. Its estimated the plant will cost around $75 million to construct. 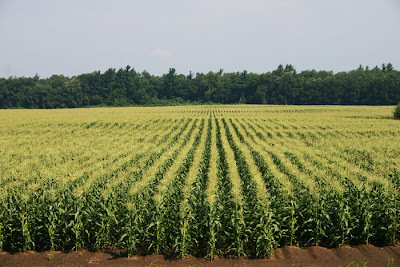 ERIE, Ill. (AP) -- A fuel pipeline exploded beneath a western Illinois cornfield, sending flames hundreds of feet into the sky and leaving a 15-foot-deep crater before pipeline crews were able to stem the flow of fuel and bring the fire under control, authorities said. Nobody was injured in the explosion, which was reported around 11:15 p.m. Monday near the town of Erie, 27 miles northeast of Davenport, Iowa. Dozens of residents were evacuated from their homes as a precaution and the flames could be seen for dozens of miles, fire officials said. Most residents were allowed to return by early Tuesday morning. Residents reported hearing a loud blast, said Erie Fire Chief Doug Rutledge, who said the hole created by the explosion was about 20 feet wide and 40 feet long. "It had a roar like a jet engine," with flames as high as 250 feet, Rutledge told the Daily Gazette in Sterling, Ill. "It was something else." The pipeline was carrying a mixture of ethane and propane from Iowa City, Iowa, to a petrochemical plant in Morris, Ill., 62 miles southwest of Chicago, said Rick Rainey, spokesman for the pipeline's owner, Houston-based Enterprise Products Partners. Enterprise Products workers were able to remotely turn off a valve to limit the gas flow to the site, fire officials said. Rainey said the fuel did not spill, but either vaporized or burned off. He said it is too soon to say what caused the explosion, and that the company was investigating. A spokesman for the U.S. Pipeline and Hazardous Materials Safety Administration said that agency would investigate, and an inspector was en route to the explosion site. The investigation will include determining if the operator was in compliance with federal pipeline safety regulations. An Illinois Environmental Protection Agency spokesman said officials there were aware of the blast and able to assist if needed, but were not directly involved in the investigation. 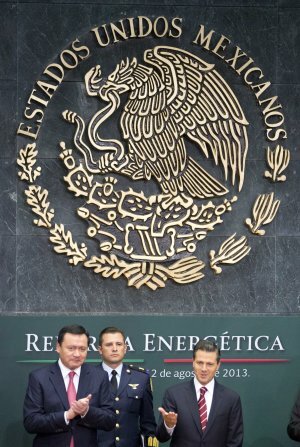 MEXICO CITY (AP) — Mexican President Enrique Pena Nieto proposed on Monday lifting a decades-old ban on private companies investing in the state-run oil industry, a cornerstone of Mexico's national pride that's seen production plummet in recent decades. The reform would allow profit-sharing contracts with private companies that have exploration know-how in deep water and other difficult areas that the state-owned oil company, Pemex, doesn't have. Such contracts are currently prohibited by the constitution, which would have to be changed. The leftist Democratic Revolution Party says it won't support constitutional changes, but Pena Nieto's ruling Institutional Revolutionary Party and the conservative National Action Party have enough votes combined to secure the two-thirds majority need in the Senate to pass the change. They could do the same with the support of a small, allied party in the Chamber of Deputies. The measure then would have to be approved by at least 17 of the country's 32 state legislatures. "Mexicans will remain the sole beneficiaries of the country's oil profits," Pena Nieto said as he presented his proposal. "It's time to use all of our energy resources to move forward and transform Mexico." 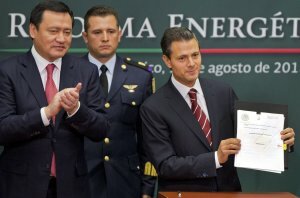 Pena Nieto's administration offered virtually no details about how it envisioned private participation, and Energy Secretary Pedro Joaquin Coldwell refused to specify the maximum percentage of profits that could be shared. The apparent vagueness of the proposal raised uneasiness. "This has to be carefully studied to see what they mean with this, and what percentage of the profits they would share," said Jesus Zambrano, leader of the leftist Democratic Revolution Party. "This kind of talk is the kind of thing they use when they want to pull the wool over our eyes." Mexico City-based oil analyst David Shields said the private sector may be underwhelmed by the plan, which like a measure in 2008, appears to make only marginal changes. "There are no specifics, and with no specifics it is not clear what is going to attract foreign investment," Shields said. "It's as if they opened the door a little bit in 2008 and now they're opening it another little bit, but it's a long way to go before it's open" in the view of private oil companies. He said the companies want the opportunity to share in the actual oil found and to add oil reserves to their own corporate books. Neither would be permitted under Pena Nieto's proposal. 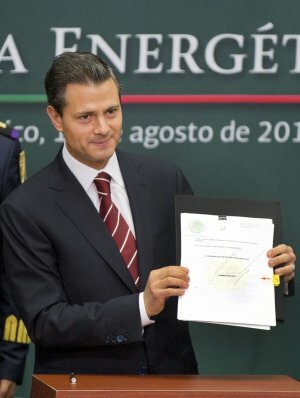 Pena Nieto emphasized an accompanying measure that would allow private companies to produce and sell electricity for home and business use. He said that would lower consumer prices in a country where people earn far less but pay about 25 percent more for electricity than in many other countries. Pena Nieto said private companies would be able to bid for profit-sharing contracts to explore and extract oil, and could also apply for permits for refining and transportation. Mexico's oil fields are drying up and Pemex lacks the equipment to explore for new reserves in deep water or to extract shale gas. Production has plunged about 25 percent over the last decade, and a country that was once a significant oil power could become a net energy importer in a few years unless new production is brought online. Mexico produces about 2.5 million barrels a day, Pena Nieto said, placing the country among the world's top 10 producers, according to the U.S. Energy Information Administration. He said his proposal would boost Pemex production to 3 million barrels a day by 2018 and 3.5 million by 2025. Mexico sends 85 percent of its oil exports to the United States and regularly ranks among the top foreign sources of oil used in the U.S. The energy secretary said that under the proposal private firms could even build private oil pipelines, although in a country where fuel thieves drill into Pemex pipelines thousands of times each year, it's not clear how many companies would want to invest in that market. Joaquin Coldwell said the pipeline problem is a clear example of the limits of Mexico's current system: Because only Pemex is allowed to build pipelines, they're old and insufficient. "So we have to transport oil in tanker trucks. The only thing is, it costs three times as much," he said. He said Pemex's bloated work force would suffer no cuts as the company is reorganized into two main divisions — one for exploration and production, the other for refining, petrochemicals and distribution. Joaquin Coldwell said Mexico hasn't talked about the changes with big oil companies. Pushing through the proposal without the left's support could come with big political costs: a 2012 poll of 2,400 Mexicans by the Center for Economic Research and Teaching said 65 percent opposed any foreign investment in the oil industry. The poll by the Mexico City-based think tank had a margin of error of two percentage points. When Pena Nieto's predecessor, Felipe Calderon, tried a similar overhaul in 2008, thousands marched in the streets and Democratic Revolution legislators padlocked the doors of Congress, camping out in the chambers in protest. The watered-down bill that resulted failed to solve Pemex's underlying problems of inefficiency and declining production. The new proposal also threatens to split the Pact for Mexico, the de facto alliance of all three major parties that Pena Nieto is depending on to get major reforms passed. Pena Nieto's Institutional Revolutionary Party, the PRI, and Zambrano's Democratic Revolution both accused each other of being conservative and blocking Mexico's march toward the future. "These reforms do the country no good. They are regressive, right-wing, conservative and pro-privatization," said Zambrano. Manlio Fabio Beltrones, leader of Pena Nieto's party in the Chamber of Deputies, countered: "This is a progressive, cutting-edge reform that seeks to leave behind any conservative attitudes." The fight centered over Pena Nieto's use of Lazaro Cardenas, the beloved former president who nationalized the oil industry in 1938, to pitch the reform. Cardenas actually allowed some private contracts, but the left called the president's mention of Cardenas "an insult." At present, Mexican law limits private companies to straight contractual work with incentive bonuses. Pemex already allows private contractors to do tasks such as operate drills and wells, perform maintenance and provide supplies. But those "integrated contracts" have proven so unappealing to investors that no one bid on half the oil field blocks near Mexico's Gulf Coast that Pemex put up for auction in July. 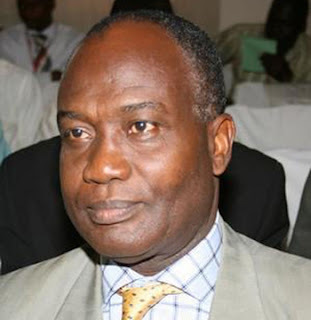 The Board Chairman of State Insurance Company (SIC), Max Cobbinah, together with five other board members have resigned their posts for fear of being sacked by the president. They announced their decision at the insurance firm’s recent annual general meeting held in Accra. The other five board members that have resigned their posts include the Chief Executive Officer of Tema Oil Refinery, Ato Ampiah, Kingsley Awuah-Darko, Yvonne Osei Tutu, Dr. Vitus Anaab-Bisi and Dr Kofi Amoah, the largest individual shareholder who was representing the interest of minority shareholders. Recently, The Independent reported that President Mahama would soon appoint new board members of some state institutions particularly SIC and Merchant Bank because of the poor state of the two firms. The workers of SIC had recently called for the resignation of their board chairman else they will go on a demonstration. 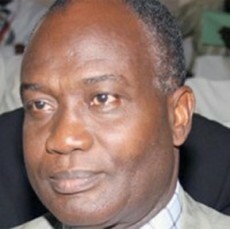 Mr Cobbinah’s resignation will, therefore, come as a big relief to the workers. President Mahama, a couple of weeks ago, announced new directors for SSNIT, ADB and the Ghana Statistical Service. 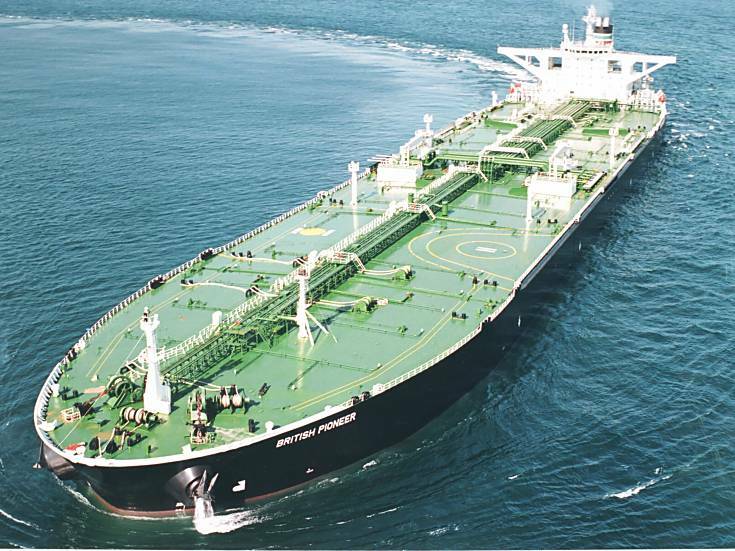 Japanese engineering concern MODEC is to convert the former Tanker Pacific managed VLCC ‘Centennial J’ into an FPSO. Once converted, the 1997-built vessel will capable of handling 80,000 barrels of oil per day, plus 170 MM standard cu ft of gas per day and will have a storage capacity of 1.7 mill barrels of oil. 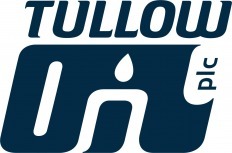 Scheduled for delivery in 2016, the FPSO will be installed in the Tweneboa, Enyenra, and Ntomme (TEN) fields in Ghana’s Deepwater Tano contract area in water depth averaging 1,500 m.
The contract was awarded by Tullow Ghana, a wholly owned subsidiary of Tullow Oil and calls for the supply, charter and lease, operations and maintenance of the FPSO. This is the second FPSO that MODEC will supply and operate in Ghana for Tullow, following the ‘FPSO Kwame Nkrumah MV21’, which is moored in the Jubilee Field development, a contract which was awarded in 2008. Seven VLCCs have appeared on brokers’ newbuilding lists, marking their first appearance for several months. In addition, four modern units were thought to have changed hands and one was reported as sold for demolition. 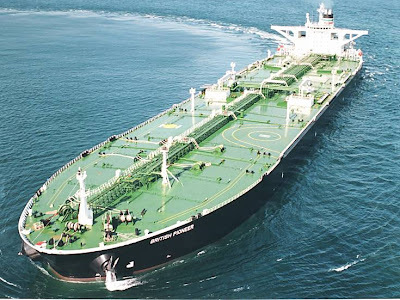 China Merchants has reportedly ordered four VLCCs for $85 mill each – two at Jiangnan and two at Dalian - while a UAE tanker concern has ordered three VLCCs at recently formed Japan Marine United (JMU) for $93 mill each, according to brokers’ reports. As for the sales, two modern Gulf Navigation VLCCs were reported sold to undisclosed interests for $90 mill en bloc. The vessels were the 2006-built ‘Gulf Eyadah’ and the 2007-built ‘Gulf Sheba’. A Chinese concern was said to have sold the 2010-built VLCCs ‘Grand China’ and the 2011-built ‘Peace China’ to Greek interests for $109 mill en bloc. Sold for recycling was the 1996-built ‘Seagull’, purchased by Indian breakers for $428 per ldt. In another sale reported, D’Amico’s recently delivered Suezmax ‘Mare Venetum’ was believed sold to undisclosed interests for $51 mill. She was delivered in April this year. The 2003-built MR ‘Tapatio’ was said to have been sold to Norwegian interests for $19.9 mill. The sale was thought to include a five-year bareboat charter at $7,500 per day. Marubeni Corp’s 2007-built MRs ‘Challenge Paradise’ and ‘Challenge Pioneer’ were also thought sold to a US-based fund for $20 mill each. Navios Maritime Acquisition Corp has confirmed the chartering out of four newbuilding MR2s. One newbuilding MR2 has been chartered out for four years at a base rate of $15,356 (net) per day, plus 100% profit based on an index, with a ceiling of $20,475 (net) per day. Charter base and ceiling rates will increase by 2% per annum. This vessel, to be delivered in 3Q13, is expected to generate around $3.2 mill annual base EBITDA for the first year ($13.5 mill of aggregate base EBITDA including the annual 2% increase over the duration of the charter), assuming her opex approximates the current operating costs and 360 revenue days per year. Three newbuilding MR2s have been chartered out for two years at a base rate of $14,319 (net) per day, plus 50% profit sharing. Each vessel is expected to generate about $2.8 mill of annual base EBITDA ($5.7 mill of aggregate base EBITDA), assuming their opex approximates the current operating costs and 360 revenue days per year. Navios Acquisition said that it expected these vessels will be delivering in Q1, Q3 and Q4 of 2014. Also in the charter market, the 2000 – built MR ‘Ravnanger’ was believed fixed to Koch for 12 months for $13,250 per day with an option for a further 12 months attached. Apart from the VLCC mentioned above, three more large crude carriers were reported to be leaving the fleet. These included the 1992-built Aframax ‘Eagle Centaurus’ sold on private terms to Pakistan breakers and the VLCC FSOs ‘National’ (built 1993) and ‘Titan Ruchira’ (built 1991) both also sold to Pakistan on private terms. In addition, China Shipping was said to have disposed of the 1992-built Panamax ‘Da Qing 92’ to unknown recyclers.